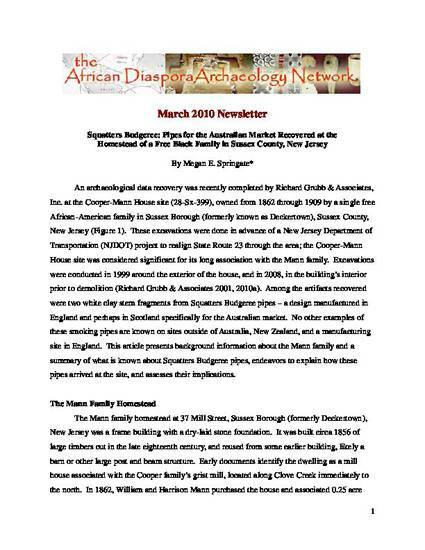 An archaeological data recovery was recently completed by Richard Grubb & Associates, Inc. at the Cooper-Mann House site (28-Sx-399), owned from 1862 through 1909 by a single free African-American family in Sussex Borough (formerly known as Deckertown), Sussex County, New Jersey. These excavations were done in advance of a New Jersey Department of Transportation project to realign State Route 23 through the area; the Cooper-Mann House site was considered significant for its long association with the Mann family. Excavations were conducted in 1999 around the exterior of the house, and in 2008, in the building's interior prior to demolition (Richard Grubb & Associates 2001, 2010a). Among the artifacts recovered were two white clay stem fragments from Squatters Budgeree pipes – a design manufactured in England and perhaps in Scotland specifically for the Australian market. No other examples of these smoking pipes are known on sites outside of Australia, New Zealand, and a manufacturing site in England.  This article presents background information about the Mann family and a summary of what is known about Squatters Budgeree pipes, endeavors to explain how these pipes arrived at the site, and assesses their implications.